Our perspective of everything we see, everything we do, and everything we think is distorted by the lens of our vanishingly short time on this earth as living, thinking beings. The distortion is exacerbated by our inability to fully grasp events that occur beyond the relatively small geographical boundaries imposed by our daily life. With this myopic perspective, it is nearly impossible for us to think globally or act with anything beyond the immediate future. We are slaves to our own perception of what is real and what is important. It is arrogant to think that humans can have any lasting impact on the earth – positive or negative. In the grand scheme we are a mere flash in the pan. When one sees the smog in cities, realizes that humans are causing global warming, and understands that there are thousands of fewer species this year than last year, it is impossible to deny that humans are having a destructive impact on our world. In fact, there is a growing consensus that the earth is experiencing its sixth mass extinction and that humans bear responsibility. But really, any consternation regarding these facts is because our cognitive event horizon is measured in years, not millennia, not even decades. Today’s visionaries speak of planning for the future in terms of 20 years not 20,000. Humans do what they do based on what will happen to THEM in the next hour, maybe the next month and possibly the next year. It is not a pretty picture. The following chart puts our temporal distortion in perspective. Assume we scale the last 400 million years to fit in 24 hours. At midnight, the first lungfish walks ashore 400 million years ago. Six hours later on our 24 hour clock the supercontinent, Pangaea, begins to slowly break apart. Dinosaurs appear around 10 am and are extinct by 10 pm. 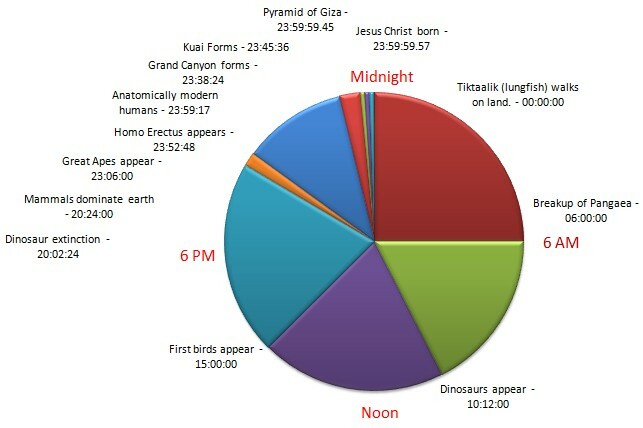 Anatomically modern humans appear around 200,000 years ago which would correspond to 11:59:17 pm. And, at approximately half a second before midnight, Jesus Christ would have been born. To put this in perspective, half a second is about the time it would take for your keys to hit the ground if dropped three feet. The point is that humans tend to think of 2000 years as a long time ago but when compared to geological time it is trivial. It is inconceivable that anything would change the trajectory of humankind’s existence. There are simply too many people that are surviving today to day to have the luxury of being troubled about what happens next month let alone next year, or next century. There is simply no incentive that can actuate any response that gets us past living day to day. What, then, is one aware of this situation to do? First of all, take comfort in realizing that the earth will be here more or less in the same condition in 100,000 years. There may not be humans polluting the air and water but there will be air and water. It is arrogant to think that we can have such a dramatic impact to change that fundamental fact. Not sure? Drop those keys again. That doesn’t mean we should all surrender and buy an SUV. It is the human spirit to want to make a difference. And it’s possible. There’s an old backpacking expression, “take care of the ounces and the pounds take care of themselves” meaning that paying attention to the small details will eventually have a greater impact but only if attention is paid to the small details in the first place. It’s difficult to accept that our actions are insignificant and at the same time think we can make an impact by our actions. Maybe we can and maybe we can’t but there’s something to be said for going down swinging! Anti Obamacare Advertising Targeting the Uninsured and Unhealthy.